Sant Romà de les Bons is a small and pretty church located in Encamp, Andorra. 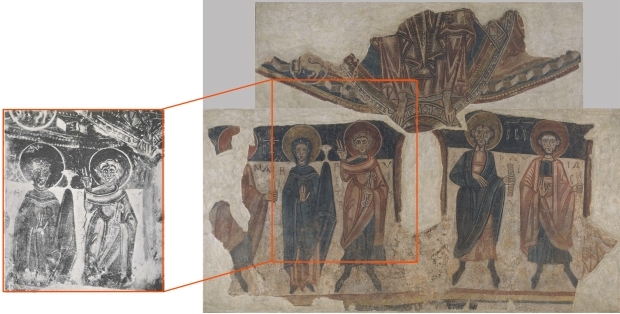 We would like to share the restoration of the two fragments of Romanesque mural painting which were taken down a strappo and transferred, which came from this place and have been conserved in the Museu Nacional d’Art de Catalunya since they were included, in 1932, with the Plandiura Collection. Lluís Plandiura bought them from the art dealer Bardolet and in 1934 they were exhibited for the first time. From September 2014 onwards, the exhibition Welcome to your home will be held in Andorra to which the Museu Nacional will loan these two paintings among other works. 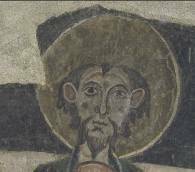 It was probably the Italian restorer Arturo Cividini that was the person who took down these paintings from the apse of the church, if we take into account the period of their removal (between 1926 and 1930) and the fact that he habitually worked for the collector Plandiura. He put them up in a flat way, in two separate fragments, while originally they went together and in a semicircular way. The original support of the wall was substituted by two transfer canvasses and slatted wood with canvas and plaster. Added to the drastic extraction operation, or removal of the paintings, were specific interventions in diverse periods, with different materials, which complicated the current intervention. 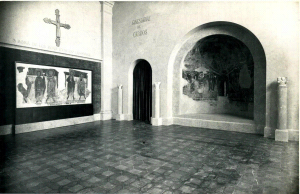 Installation of the Apostolate of Sant Romà de les Bons in the museography of Folch i Torres in 1934. 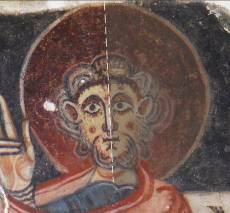 The museum carried out the study and restoration of these two fantastic fragments. The conservation of the Apostolate was delicate. Despite the fact that the tensing of the support was regular, it suffered from depressions in some parts of the back as a result of the handling. It had accumulated a lot of generalised dirt on the back, a combination of different types of stucco that created tensions in the original painting. The lower part of the work was severely damaged, and was so prior to its removal, because the apse had suffered from damp and water leaks. The restoration offered us an important aesthetic change after the cleaning of the surface dirt and the removal of the stucco stuck on the original polychrome. Archive photograph. Original location with the mandorla. Apostolate and Maiestas Domini. Furthermore, the integration of neutral colour had been eliminated from the large gap that surrounds the painting with a double objective: to find out what the exact perimeter of the original fragment was, and of no lesser importance, to apply a neutral colour closer to that of the original mortar of the church. Due to the remodelling of the Romanesque Art Room in 2011, a study was carried out that took nearly two years, so as to choose a new treatment for the large neutral areas: more natural and respectful, that would give value to the original and recuperate the mural character. 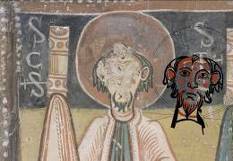 Within the global study that we are carrying out of the work, let us point out here a curiosity: the major similarity between the heads of the apse of Encamp and of Sant Miquel d’Engolasters. 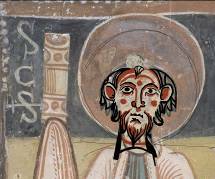 This demonstrates the fact that the Master of Santa Coloma, such as other masters of mural painting, used patterns for the heads of their figures in both apses. 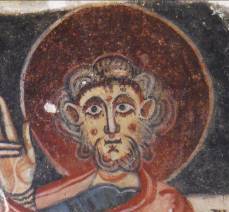 Head of saint Pau de Sant Romà de les Bons prior to the intervention. 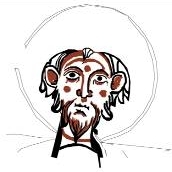 Tracing of the head of saint Pau. Head of saint, Sant Miquel d’Engolasters. 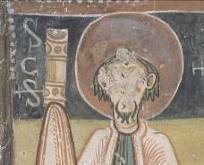 The same head with the tracing of the head of Pau de Sant Romà de les Bons. Fitting the two heads together. Was it a habitual practice?